Status: Common regular breeder extreme southeast, rare casual elsewhere; hybrids and introgressants with Spotted Towhee elsewhere except Panhandle. Common regular spring and fall migrant within and near breeding range, rare elsewhere. Rare casual winter visitor southeast. 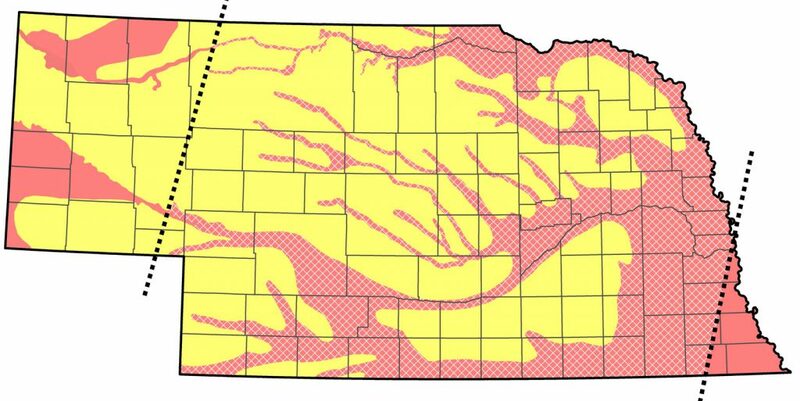 Hybrid zone between Spotted and Eastern towhee shown in the area with cross-hatching with pure Eastern Towhees occurring in southeastern Nebraska east of the dashed line. Documentation: Specimen: UNSM ZM7238, 19 Jan 1900 Saltillo, Lancaster Co.
Taxonomy: Four subspecies are recognized (Pyle 1997): erythrophthalmus, breeding from Manitoba to Maine and south to Oklahoma and Virginia, wintering to south Texas and Florida, canaster, breeding from Louisiana to Tennessee south to South Carolina and Florida, wintering in South Carolina and Florida, rileyi, resident from Alabama and southeast Virginia to northern Florida, and alleni, resident in peninsular Florida. Nebraska birds belong to the widespread subspecies erythrophthalmus. See Spotted Towhee for discussion of interbreeding with that species in Nebraska. There are earlier dates 4 Mar 2014 Lancaster Co, 9 Mar 2005 Stanton Co, 13 Mar 2016 Buffalo Co, 16 Mar 2012 Omaha, two on 19 Mar 2000 Kearney, Buffalo Co, and 20 Mar 2016 Douglas Co.
Migration peaks in late Apr-early May. Ludlow (1935) listed it as a common migrant in Webster Co, occurring in the period 5 Apr-9 May, and a specimen, HMM 2022, was taken at Inland, Clay Co 3 May 1915. Migrants, including hybrids and occasional birds that resemble phenotypically pure Easterns, are reported regularly westward to Keith Co in the Platte River Valley and northeastward through the Sandhills to northeast Nebraska near Yankton, South Dakota. A phenotypically pure silent male was at Lake McConaughy, Keith Co 21 Apr 2007, and one was in Custer Co 29 Mar 2010. High counts: 24+ at Ponca SP, Dixon Co 2 May 2009, 17 at Fontenelle Forest, Sarpy Co 16 Apr 2016, and 16 at Pawnee Lake, Lancaster Co 18 Apr 2017. Summer: Bartos Smith and Greenlaw (Figure 2; 2015) showed that within the Pipilo towhee hybrid zone, which includes most of Nebraska, Spotted Towhee genes predominate in the Panhandle, the northwestern Loup drainage, and along the northern edge of the state following the Niobrara River Valley and Missouri River Valley east to the Yankton area, while Eastern Towhee genes predominate elsewhere. Pure Eastern Towhees are found only in the extreme southeast. Reports of birds that resemble phenotypically pure Easterns near the western and northern edges of their “genetic range” (see Taxonomy; Bartos Smith and Greenlaw 2015), include 9 Jun 2001 at Enders Reservoir, Chase Co, one that “looked and sounded” like this species at Scotts Bluff NM, Scotts Bluff Co 17 Jul 2013, a pair in Dawson Co 6 Jul 2015 and another there 13 May 2004, 25 Jun 2015 Thomas Co, 26 Jun 2015 near NNF McKelvie, Cherry Co 26 Jun, two on 14 Jun 2016 Fort Niobrara NWR, Cherry Co, and a male paired with a Spotted Towhee in Keya Paha Co 2 Aug 2009. There are later reports 1-3 Nov 2001 Ponca SP, Dixon Co, 2-6 Nov 2018 Omaha, Douglas Co, and 16 Nov 2010 Lancaster Co; most depart by the end of Oct. The 26 at Two Rivers SP, Douglas Co 5 Oct was indicative of peak fall movement. Winter: There are no records of overwintering, although there are scattered reports Dec-Feb in the southeast, most from CBCs, that may be of birds making the attempt. During the 24 years of CBCs 1991-1992 through 2015-2016, Eastern Towhees have been reported 13 different years with a total of 20 individuals. Only the second report for the Branched Oak Lake-Seward CBC was one on 14 Dec 2002. There are several reports from the DeSoto NWR CBC: two on 31 Dec 2005, four on 27 Dec 2008, 29 Dec 2013, and two on 31 Dec 2015. Additional Dec-Feb reports are 14 Dec 2001 Lancaster Co, 2 Jan 1999 Washington Co, 11 Jan 2011 Fontenelle Forest, Sarpy Co, 19 Jan 1900 Lancaster Co (specimen cited above), 14 Feb 2014 Lancaster Co, 23 Feb 2016 southeast Washington Co, and 25 Feb 2018 at Fontenelle Forest. Late dates for northerly locations are of one on the Norfolk CBC 17 Dec 1994, and a male at Ponca SP, Dixon Co 11 Jan 2009. Photograph (top) of a Eastern Towhee at Fontenelle Forest, Sarpy Co 5 May 2011 by Phil Swanson. Bartos Smith, S., and J.S. Greenlaw. 2015. Spotted Towhee (Pipilo maculatus), version 2.0. In The Birds of North America (P. G. Rodewald, Editor). Cornell Lab of Ornithology, Ithaca, New York, USA. https://doi.org/10.2173/bna.263.